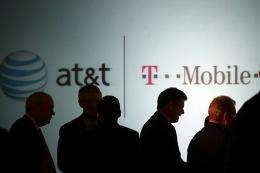 Executives at AT&T attend a news conference where it was announced that AT&T Inc. will be buying its wireless rival T-Mobile USA from Deutsche Telekom AG for $39 billion in cash and stock on March 21, in New York City. Sprint Nextel, the third-largest US wireless provider, urged US regulators on Monday to block AT&T's $39 billion acquisition of T-Mobile USA, saying it would harm competition. Sprint Nextel, the third-largest US wireless provider, urged US regulators on Monday to block AT&T's $39 billion acquisition of T-Mobile USA, saying it would harm competition. "Sprint urges the United States government to block this anti-competitive acquisition," Sprint senior vice president for government affairs Vonya McCann said in a statement. "This transaction will harm consumers and harm competition at a time when this country can least afford it," McCann said. "On behalf of our customers, our industry and our country, Sprint will fight this attempt by AT&T to undo the progress of the past 25 years and create a new Ma Bell duopoly." AT&T's proposed purchase of T-Mobile, the US unit of Germany's Deutsche Telekom, will require the approval of the US Department of Justice and the Federal Communications Commission. Members of the US Congress have also pledged to take a close look at the takeover of the fourth-largest US wireless provider by the second-largest. AT&T chief executive Randall Stephenson said last week he was "very confident it will be approved." Sprint, in its statement, said "AT&T and Verizon are already by far the largest wireless providers. "If approved, the proposed acquisition would create a combined company that would be almost three times the size of Sprint in terms of wireless revenue and would entrench AT&T's and Verizons duopoly control over the wireless market," it said. Verizon currently holds a 31-percent share of the US wireless subscriber market followed by AT&T with 27 percent. Adding T-Mobile's 37.3 million customers would give AT&T a 39-percent share of the market, putting it ahead of Verizon and Sprint, which had also expressed interest in acquiring T-Mobile.